Peugeot Sport dominated the two prominent hill climb events last year with the awesome 208 T16 – winning at Pikes Peak in record time, as well as setting the fastest run through the Goodwood hill climb course. Now, it has set its sight on yet another legendary event, the gruesome Dakar Rally. Taking up the challenge this time is the 2008 crossover. Well, the name and basic silhouette, at least, as the Peugeot 2008 DKR teased here will have as much in common with the road car as the 875 hp 208 T16 Pikes Peak has next to the plain vanilla 120 hp 208 VTi. Little else is known yet, but the big side air intakes should feed a mid-mounted diesel engine. Peugeot is known for its brawny oil-burners anyway (in Europe, that is), and such motor’s fuel efficiency would count for a lot through the 10,000 km off-road marathon in 2015. 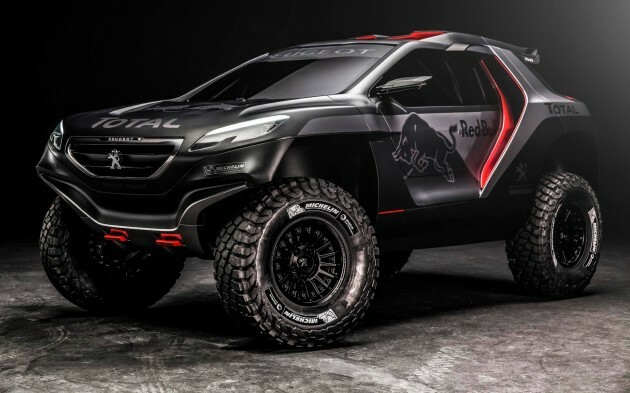 Peugeot has won the Dakar Rally five times before (consecutively from 1987 to 1990), and is now pinning the hopes of its big return in the hands of past Dakar winner and double WRC champ Carlos Sainz and five-time Dakar Rally motorbike winner Cyril Despres. This is going to be the next VW. Winning people heart globally with affordable price european brand. Peugeot trully fulfill the demand for design and performance. This brand is indeed making a comeback. Peugeot’s cars have good design, but good performance is only applicable to the top of the range models. The weakness? recent pricing strategy by Naza in Malaysia. The recently launched 2008 is priced too high. The indicative price for the facelifted 3008 at 155k is also high. Unfortunately, Dakar is lacking in Works entries for Car class. Hopefully we’ll see the return of VW and Mitsubishi to do battle with Peugeot! yea, at least we could compare performances with those big boys in dakar rally…win or lose, at least we could know..